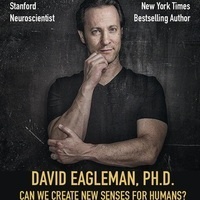 Dr. Eagleman is known for his research on brain plasticity, time perception and synesthesia. He is the author of many books including The Runaway Species, The Brain, Incognito and Wednesday is Indigo Blue in addition to a cognitive neuroscience textbook, Brain and Behavior. Dr. Eagleman has been a TED speaker and a guest on the Colbert Report. He is also the writer and presenter of the Emmy-nominated international television series, The Brain with David Eagleman.